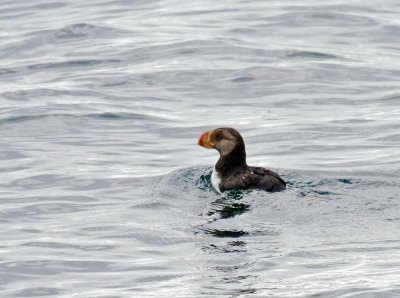 Increasing seabirds in Gulf of Alaska and decreasing in Southern California? An interesting article appears on the Marine Ecology Progress Series in the article: Phenology of pelagic seabird abundance relative to marine climate change in the Alaska Gyre by Thompson SA, Sydeman WJ, Santora JA, Morgan KH, Crawford W, Burrows MT (2012). Overall, 5 species showed no change, 1 declined, and 9 species as well as all species combined showed increasing abundance. By season, 3 species increased in winter, 7 in late spring, and 6 in late summer. Eight of 15 species showed relationships with our environmental index. Increases in seasonal seabird abundance may be related to lengthening of the ‘growing season’, as demonstrated by temporal temperature shifts and expansion of peak chlorophyll concentrations. Seabirds of the Alaska Gyre are probably responding to changes in forage nekton that are related to this extended growing season by shifting their migration to later dates. The full text appears in a pdf link. This is one study of several that may point to a redistribution of seabirds (abundance and diversity). It appears there is a trend for fewer seabirds in the Southern California Bight and more birds for a longer portion of the year in the SE Gulf of Alaska.